Make sure the maca supplement you take passed our quality review and is right for you! Maca has long been touted for energy, stamina, improved mood, and sexual enhancement — and some of these effects have been demonstrated in preliminary clinical studies. But how do you choose the best maca supplement — one with real maca and minimal contamination? 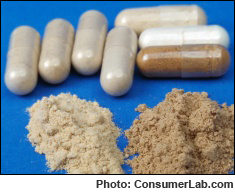 ConsumerLab.com purchased, tested and reviewed many popular brands of maca root powder (including gelatinized powders) to help you. We used DNA testing, microscopic evaluation, as well as our own taste tests. We found many products which contain real maca. However, one product contained an unacceptable amount of lead — a heavy metal. Another appeared to contain less maca than claimed and more filler. To help you find the best price and value with maca supplements, ConsumerLab.com also compared the maca supplements on cost. We found that you can get a daily dose of quality maca for less than 20 cents. Tips for buying and using maca, and more! (6/30/2015): It was reported to CL that the supplement company selling the maca product which was contaminated with lead has claimed that CL's results were "exaggerated" and that the product must contain a lower amount of lead to meet the company's specfications which are monitored by third party audits. The suggestion CL's results are "exaggerated" is incorrect. CL's findings were confirmed in a second independent laboratory prior to publication. That laboratory found a slightly higher amount of lead than the first, but CL published the lower of the two, since that amount could be substantiated by both labs. Rather than an exaggeration, CL provided the most conservative figure. More details are provided in the Update near the top of the full Review.